Investigate the ruined crypts near Tal'Deic Fortress. 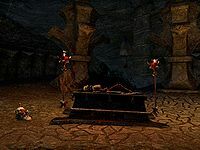 I volunteered to enter the ruined crypts beneath the fort to look for the retainer, Durel Gilveni, and the mysterious others mentioned in the General's dispatch. The entrance is by the river. Find proof of Gilveni's claim. The entrance to the ruins is down by the river, beyond the north gate of the fortress. I need to head there and enter the crypts. Now that I'm inside the ruins, I should see if I can find Durel Gilveni, the General's retainer. The Maulborn have infiltrated this area, so I need to be careful. The retainer turned out to be a Maulborn agent. He claims General Gavryn has been killed. I need to find proof of the General's death in the crypts below. The General's imposter ambushed me! I must defeat him! I have proof of the General's death. I should inform Captain Valec that he was slain by a Dremora imposter. Finishes quest I informed Captain Valec about what I found in the ruins beneath Tal'Deic Fortress. I should see if he needs anything else from me.